NASA's Solar Dynamics Observatory spacecraft spotted a "sun tornado" spinning superheated plasma on April 29-30, 2014. A NASA spacecraft has captured spectacular video of an enormous plasma "tornado" spinning off the sun. NASA's Solar Dynamics Observatory probe, or SDO, watched the dark-hued twister churn and ultimately erupt over the course of one day, from April 29 to 30. Mission scientists used the spacecraft's imagery to create an 18-second-long video of the dramatic solar tornado. "The suspended plasma is being pulled and stretched by competing magnetic forces until something triggers the breakaway," NASA officials wrote on SDO's Facebook page, assuming the voice of the spacecraft. "This kind of activity is fairly common on the sun, but we have only been able to view them at this level of detail since I began operations just four years ago." The plasma appears dark in this ultraviolet-light view because it is cooler than the material surrounding it, NASA officials added. The $850 million Solar Dynamics Observatory launched in February 2010 on a five-year mission to study the variations in solar activity that influence life on Earth. The probe uses three different instruments to observe the sun, gathering data that is helping scientists better understand the solar magnetic field and space weather. 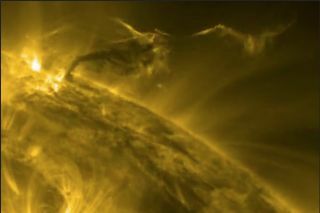 Over the course of its operational life, SDO has recorded many stunning images of solar flares, coronal mass ejections and other sun phenomena. Solar activity waxes and wanes on an 11-year cycle. The sun is now in an active phase of the current cycle, which is known as Solar Cycle 24. However, the sun has been notably quiet during Solar Cycle 24, and scientists say the current maximum is the weakest in the last century or so.